You can also demand that Congress save the Iran nuclear deal and share your net neutrality story. This week’s Take Action Now is focused on saving the Iran nuclear deal, sharing our net neutrality stories, and fighting Trump’s latest Muslim ban. Demand that Congress save the Iran nuclear deal. Last Friday, President Donald Trump announced his intention to decertify the Iran nuclear deal, threatening to ratchet up tensions with Iran and hurt diplomatic efforts with North Korea. As dangerous as this move is, it doesn’t formally put an end to the agreement. Instead, it passes the issue onto Congress, allowing that body to vote on reimposing sanctions, a move that would almost certainly cause the deal to fall apart. Call your members of Congress at 202-224-3121 and demand that they reject any efforts that would threaten the Iran nuclear deal. Share your net neutrality story. The Federal Communications Commission could soon vote to end net neutrality, the principle that all content on the Internet be treated equally. While we know the agency listens to deep-pocketed cable companies when it comes to the future of the Internet, the rest of us have our own stories to tell. Whether yours centers on activism, starting a business, connecting with loved ones, or any of the many ways we use the Internet, tell it here (you can also use that link to read other stories!). Free Press Action Fund will share some of the stories on social media and will make sure key lawmakers hear from you. Attend a #NoMuslimBanEver event. This afternoon, a federal court in Hawaii blocked the most recent iteration of Trump’s Muslim ban, preventing it from going into effect tomorrow as scheduled. The fight is not over, however, as the administration is likely to appeal the decision. The most recent order threatens to be even more dangerous than previous attempts, as it bans most travel from five predominantly Muslim nations—and restricts travel from three other countries—indefinitely, with no end in sight. 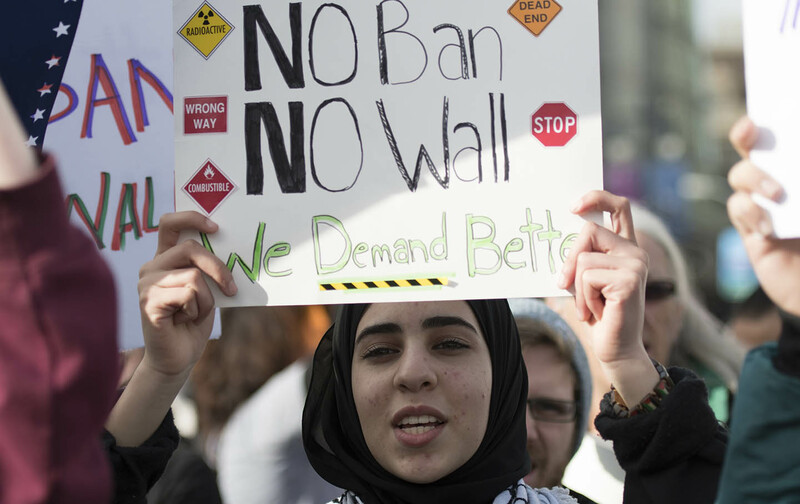 On October 18, people across the country are gathering to demand an end to the Muslim ban once and for all. Events include a rally in front of the White House, another at O’Hare International Airport, vigils in Nashville and Chattanooga, and other events nationwide. You can find an event near you here or sign up for the White House rally here. You can also follow the actions using the hashtag #NoMuslimBanEver.